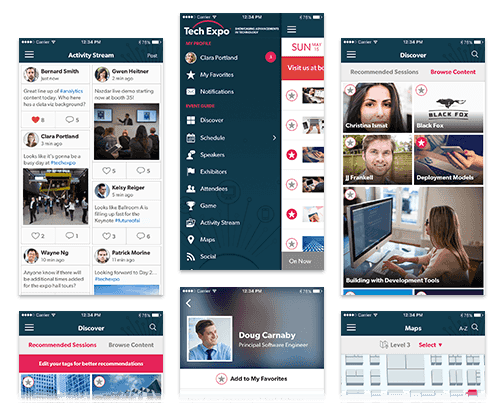 Eventbase's Enterprise Event Platform creates a holistic attendee experience and collects valuable attendee insights with all of your corporate meetings and conferences hosted within your branded Enterprise Event App. Eventbase Manager, our self-service platform, lets you update event content and access analytics in real-time without technical expertise. You can also use Eventbase Manager to easily create and publish smaller Essential events in your Enterprise Event App with agenda details, networking features, floor plans, maps and more. Your attendees deserve a beautiful, visually-engaging app that is far from boring. Our team will work with you to create a stunning Enterprise Event App that is tailored to your brand with custom fonts, graphics and animations. We will make your brand look great and deliver an exceptional user experience that attendees – and your team – will love. For your premium meetings, Eventbase is proud to offer the industry's most intelligent chat bot capable of answering complex questions about your event with visually rich responses within your event app. We also offer an advanced Recommendation Engine, which uses intelligent algorithms to guide attendees to sessions they may like and suggest attendees they may like to meet. Drive app adoption and elevate your attendee experience with engaging features like our Game, Activity Stream and Audience Interaction. Encourage attendees to earn points and compete for prizes by completing tasks within the app, like meeting other attendees, sharing feedback or entering a beacon zone. Utilize our pre-configured games or design your own, and display results on a leaderboard throughout your venue. Attendees can share photos, write about their event experiences and comment on posts directly through the app. Attendees can chat and ask questions about a session, and participate in polls. Moderation tools are available. The Eventbase Platform is designed to meet the needs of corporations with the most sophisticated information security requirements. We utilize a world-class hosting facility to ensure flawless performance and we also offer the option to host your corporate meetings app in your own private cloud. This is perfect for organizations wanting to run penetration testing or independent security audits. Help attendees make better connections and add Attendee Networking to your corporate event app. Participating attendees can view attendee profiles and start a conversation with people they are interested in meeting. Provide an app experience that is perfectly suited to your different types of attendees. Assign roles based on badge type or other criteria and restrict certain information in the app. You can decide what sections of the app are available to what roles, and even choose to hide or grey-out sessions for which a user does not have access. Provide a VIP experience where your most important guests receive their own networking section, or provide a game for a sub-section of your users. Eventbase has developed the "Event API Engine”, the gold standard for interoperability. It lets Eventbase and our technology partners achieve rapid and reliable data synchronization and integrations for even the most complex events. Dozens of event registration and technology vendors have integrated with Eventbase's APIs, and only Eventbase can offer the flexibility to hot-swap a system if the need arises. Events can be stressful. When you're on-site and focused on the details that will make your event memorable, you don't want to be worrying about your event technology. Every customer receives access to support with a guaranteed Service Level Agreement. We also offer additional support packages to help you design and build your app, as well as onsite or 24x7 remote support to meet your needs.